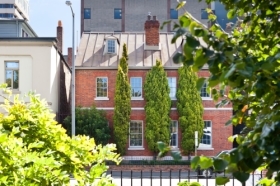 Markree House Museum and Garden is a historical gem located in inner city Hobart. Markree was built in 1926 in the Arts and Crafts Movement style by architect Bernard Ridley Walker for Cecil and Ruth Baldwin. The house contains its original 1910s-20s furnishings together with older portraits and family heirlooms from Ruth Baldwin’s family – the Manings, Knights, Fletchers and Hones – who had come to Hobart in the 1820s as merchants, civil servants and lawyers. Markree’s rare, surviving 1920s garden was laid out by Cecil Baldwin in an informal Arts and Crafts Movement style. Cecil and Ruth Baldwin’s son, Henry (1919-2007), bequeathed the house and its original contents to the Tasmanian Museum and Art Gallery. Markree specialises in the social history and design of the early 20th century with guided tours and changing displays to highlight aspects of the collection. Ask about our group booking rate and joint ticket with Narryna Heritage Museum, located 200 meters from Markree and offering insights into Hobart life 100 years earlier.